Long week? Me too. Why not relax and read an amusing and uncomplicated art crime mystery. Fast forward to Saturday night. I’ve quit the city. I’m not checking my work email. I’ve spent the day at a castle. I’m lying on my tummy, drinking wine in front of a fire. I don’t want to think at all. I want complete indulgence. Enter The Mystery of the Lost Cézanne by M.L. Longworth. Deep introspective literature this ain’t, but who wants that at times like these? 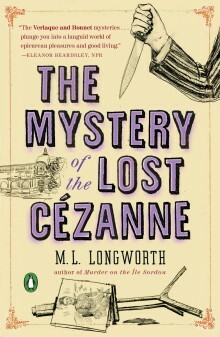 The Mystery of the Lost Cezanne was an amusing, self contained, relaxing Saturday read. I must admit that “Mystery” isn’t really a genre I have much experience with. Indeed I wonder if the closest thing to a modern mystery novel that I’ve ever read is a selection of Arthur Conan Doyle. Perhaps it is because my day-to-day is crime fact, crime fiction just doesn’t usually appeal. When I am getting paid to process headlines such as “How did a former Italian art thief end up dead in a London canal?“, I kinda don’t feel I need the book version of it. But I had a great time with The Mystery of the Lost Cézanne. I also am totally incapable of comparing it to other mystery novels. The book is part of a series of mysteries featuring Judge Antoine Verlaque and law professor Marine Bonnet who investigate crimes in Aix-en-Provence. Worry not, dear reader, the author skillfully crafts this as a stand-alone book. You don’t need the others in the series to understand the characters or their motivations. It’s all good. The story centres around Aix-en-Provence’s favourite son Paul Cézanne, his final residence, a possible non-canon Cézanne painting, and (of course) a murder. Is the painting real or fake? Should we trust academics and auction house workers? What are the motivations of the murderer? Who is the woman in the painting? Therein lies the cute little mystery. To make this at least a little bit about work, it is clear that the author did enough art crime homework to let me suspend my academic disbelief and enjoy myself. She mentions, for instance, that if the painting is declared a fake it will be destroyed. This same bit of French dealings with fakes came up recently in a conversation I had on Twitter. Perhaps you recall the case of the Chagall that was declared a fake and then scheduled for destruction in 2014. Of course, the destruction would have to be at the behest of the Cézanne estate (I think?) and I doubt that exists anymore (could be totally wrong)…eh whatever. It’s in there. Good job. Also the idea that stolen art is unsellable. Some stuff about the now-defunct Art Loss Register certificate trick. Oh and dodgy art movers. Good stuff. 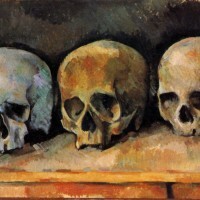 Cézanne is someone that I knew next to nothing about. I’ve never taken a great interest in his paintings, nor his life and didn’t even quite know where in France he was from. Now I feel like I should give the man a shot. The Kelvingrove Art Gallery has a Cézanne or two. Perhaps I will go take a look. I’m a sucker for connecting person to place and this book tied Cézanne to Aix-en-Provence: I need to find out more. And oh yes! I also enjoyed the setting. I’ve never been to Aix-en-Provence and I imagine the book was written for people like me in mind, at least in that respect. It is sprinkled with French words, little explanatory asides about the culture of the region and how it is perceived from the outside…stuff that makes the reader assume that the author assumes that we know what she is talking about when she is actually telling us what she is talking about. Does that make sense? If you have an interest in Art Crime and seriously just want to turn life off and relax for a couple of hours, you could certainly do worse than The Mystery of the Lost Cézanne. I chose fireplace + wine as my setting but maybe you’d prefer bubble bath + mimosa? In bed lie in + pot of coffee? Pub + pint (AKA my usual)? Okay one thing bothered me. One of the characters, an academic, is black. She’s black. Black. Black. The author seems obsessed with reminding you of this. Over and over. Gosh is she ever black. First it gets old, then it gets…weird.